Why Do Pets Always Walk On asdfadvcasdfasdf Computer Keyboards? This is Malcolm the puppy, right after walking on a keyboard and opening up 1600 email message windows at once. What is it with pets and keyboards?! Malcolm always seems to do it when I'm writing some important email or have a lot of windows open. And then he steps on it and everything goes BASDFASDGASDBASDGASd or BEEEEEEEEEEEEEEEEEEEEEP and all the keys go CLAAAAACCCCCCCCKKK as his nails scrape against the plastic. And then he wants to play and looks at me with a look on his face like, "LETS GO OUTSIDE BUT FIRST FEED ME AGAIN!" Other writers here think its because geek owners stare at their screens all day, and the pets eventually need some attention, food, or a poo break. 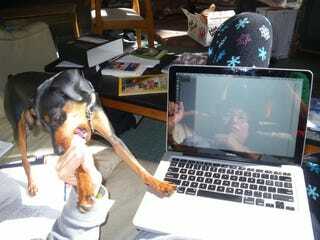 What do you think it is that makes pets want to walk on keyboards?